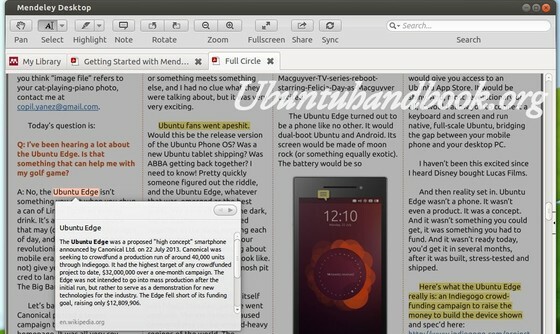 Want to annotate PDF file in Linux systems? Well, Mendeley Desktop is one of the best choice. Besides being able to highlight & add note to text / rectangle of PDF, it can also display definition of selected text from en.wikipedia.org, share the document via E-mail and sync library with Mendeley Web. Citations and bibliographies in Microsoft Word, OpenOffice.org and LibreOffice. You may check your system type (32-bit or 64-bit) via System Settings ->Details utility. Once downloaded, install it via below command in terminal (Ctrl+Alt+T). During installation, the Mendeley Ubuntu repository will be added to your list of software sources. You can then use the standard Ubuntu/Debian software update tools to keep Mendeley up to date. For other Linux, Windows, and Mac, download Mendeley Desktop installer from this page. Thanks. Mendeley is great! I’d been searching for half an hour for a way to highlight pdf text before I found this page. Thanks again for the tip! Yet another crap Web Based tool you must register for an account, THIS IS NOT A LINUX APP! More privacy issues with cloud based crap!